With the completion of this past Saturday's events in Orlando and Denver, the lineup for next Saturday's DCI Premier Event in San Antonio, Texas has been determined. The following order of appearance is figured by the competitive results of the DCI Orlando and Drums Along the Rockies events on July 12, in combination with a random draw in groups of threes (1-3 ranked corps, 4-6 ranked corps, etc.). The four top scoring corps from the afternoon event will perform again in the evening. The DCI Southwestern Championship on July 19 will be the first event of the season that will feature all 20 World Class corps in the same place at the same time. 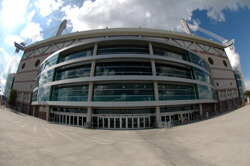 Purchase your tickets to the DCI Southwestern Championship at the Alamodome. AFTERNOON EVENT – Starting at 12 p.m. CT 1. Revoution (Open Class) – 12:00 p.m. 2. The Academy – 12:17 p.m. 3. Pioneer – 12:34 p.m. 4. Mandarins – 12:51 p.m. 5. Pacific Crest – 1:08 p.m. 6. Troopers – 1:25 p.m. 7. Madison Scouts – 1:42 p.m. Intermission 8. Crossmen – 2:16 p.m. 9. Spirit – 2:33 p.m. 10. Glassmen - 2:50 p.m. 11. Blue Stars – 3:07 p.m. 12. Colts – 3:24 p.m. 13. Blue Knights – 3:41 p.m. Times subject to change EVENING EVENT – Starting at 7 p.m. CT 1. Afternoon 4th place – 7:00 p.m. 2. Afternoon 3rd place – 7:17 p.m. 3. Afternoon 2nd place – 7:34 p.m. 4. Afternoon 1st place – 7:51 p.m. 5. Boston Crusaders – 8:08 p.m. 6. Bluecoats – 8:25 p.m. Intermission 7. The Cadets – 8:59 p.m. 8. Santa Clara Vanguard – 9:16 p.m. 9. Phantom Regiment – 9:33 p.m. 10. Blue Devils – 9:50 p.m. 11. The Cavaliers – 10:07 p.m. 12. Carolina Crown – 10:24 p.m. Times subject to change Learn more about the DCI Southwestern Championship.